Almost all of what passes for ‘cycling infrastructure’ in Britain has never generated a backlash, for one simple reason. It has never represented a direct challenge to the way our roads and streets are designed to prioritise motor traffic flow, without giving time or space to cycling in a way that might impinge on that prioritisation of motor traffic. That ‘infrastructure’ has never reallocated road space in any meaningful sense. The cycle lane in the picture above did not generate any controversy when it was painted, because it gives up at the point when things get a bit difficult. A decision was made to allocate the fixed amount of carriageway space on the approach to the roundabout in the distance entirely to motor traffic – two queuing lanes – and so the ‘cycling infrastructure’ had to end. There was no backlash against this painted bicycle symbol, because it didn’t impinge on motoring in the way a protected cycleway, replacing one of those lanes of motor traffic, would. In much the same way, the old painted lanes on Tavistock Place in London, captured in this photograph from Paul Gannon, generated no backlash – meaningless blobs of paint at the side of the road are not something anyone is going to excited about. This contrasts starkly with the situation today. Camden Council have reduced the amount of space for motor traffic on this street to just one lane, allocating the rest of it to cycling. The two-way protected track on the north side of the street is now a one-way track, with the westbound motor traffic lane converted to a mandatory cycle lane. This has generated a furious backlash from taxi drivers, in particular. In places where there is competing demand for the use of road space – in urban areas currently dominated by motor traffic flow – these kinds of decisions about what that space should be used for are inherently political. Reallocating road space, or re-directing motor traffic away from what we think should be access roads onto main roads, are effectively statements about what modes of transport we think people should be using for certain kinds of trips, and about what our roads and streets should be for. David Arditti has astutely observed that in these places of competing demand, effective measures to enable cycling should be generating a backlash. If there is no backlash, then whatever it is you are doing is unlikely to make any significant difference. If you are designing a Quietway, for instance, and nobody is moaning about it – that probably means you aren’t doing anything to reduce motor traffic levels on the route so that it is genuinely ‘quiet’, or, alternatively, it means you are sending it on a circuitous and indirect route in order to avoid difficult decisions. If you are designing a route on a main road and there is no backlash, again, something has probably gone wrong. You aren’t reallocating space and time at junctions; you aren’t moving parking bays where they get in the way of your infrastructure; you aren’t dealing with bus stops; you aren’t repurposing motor traffic lanes for cycle traffic. London is experiencing a significant backlash against cycling infrastructure because, for the very first time, that cycling infrastructure is itself significant. It is a visible and clear statement that cycling should play a role in the transport mix of the city, rather than being completely ignored – it is a challenge to the status quo, rather than being an accommodation with it, in the form of shared use footways, or discontinuous painted lanes. Or (most often) nothing at all. Of course this backlash is using all the tired, contradictory and even downright confused arguments about cycling infrastructure. In London, LBC radio seems to have emerged as a mouthpiece for these kinds of arguments, getting particularly excited (for some reason) about the fact that some people aren’t using Superhighway 5. One of their reporters, Theo Usherwood, stood by the road for half an hour on the bridge, apparently in an attempt to demonstrate that the new infrastructure is pointless because a majority of people cycling northbound aren’t using it. … and then deal with a slightly confusing junction on the north side of the river to get back to the left hand side of the road, where you were originally, just a few hundred metres down the road. Given that there is also a bus lane northbound on the bridge (which the LBC reporter himself mentions someone using), it’s not hard to explain why a good number of people are choosing not to add this inconvenience to their journey. If Usherwood had bothered to ask anyone why they were not using CS5, he would have found this out for himself. But instead he was happy to parrot his statistics in isolation, as they fit into a pre-constructed narrative about how apparently pointless cycling infrastructure is. Really, the problem here is the discontinuous nature of the infrastructure. It’s only ‘pointless’ for some users because so little of it has been built, meaning that, from some directions, people have to go out their way, pointlessly crossing the road twice (to go to the other side, and back again) to use it for a few hundred metres. The people using the cycling infrastructure will have been arriving from the Oval direction; those not using it will have arrived from the south. It’s that simple. I personally counted 750 cyclists using the Vauxhall Bridge track, more than 12 a minute, a figure which appeared in our press release. That, by the way, as the press release also stated, is a nearly 30% rise on the figure crossing the bridge before the track opened. Why do you think Mr Usherwood made no mention of this, or of his earlier visit to the superhighway? Why, I wonder, did he hang around for several hours, until “just after lunch,” and until it had started raining, to begin his count and do his report? Could it be because he was trying to make the facts fit a pre-cooked agenda that there are no cyclists using the facility? Usherwood also demonstrated a troubling willingness to strip passages from the emergency services’ responses to the Superhighways to imply they are opposed to them, when in fact they support them. I’ve just dug out the the responses of all three emergency services to the Cycle Superhighway. The London Ambulance Service says the narrowing of the road could affect their – and I’m quoting here – ‘time critical lifesaving journeys’. The Metropolitan Police is even more scathing Nick. It lists 14 separate concerns with the North-South route linking Elephant & Castle to Kings Cross. It says it will impact on response times, starting – and again I’m quoting – ‘increased congestion will result in longer travelling times for MPS officers coming into central London which will have an operational impact at times of prolonged public order demand.’ And it says that when it comes to transporting VVIPs like members of the royal family, or for that matter high risk suspects that need an armed guard – think terrorists here – it will have to close the opposite carriageway so that there is an escape route at all times for the Metropolitan Police convoy. Clear enough, you might think – the emergency services are plainly up in arms about these schemes. Except that if you refer to the document from which Usherwood stripped these quotes, it turns out that the Metropolitan Police, far from being ‘scathing’, actually support the North-South and East-West Superhighways. Likewise the London Fire Brigade (not mentioned by Usherwood) also support this both Superhighways, and the City of London Police. The London Ambulance Service make no comment either in support or opposition of the Superhighway schemes, only voicing concerns about how it might affect their response times. Against this, all four of London’s major trauma centres; hospitals; and the London Air Ambulance service, have all voiced strong support for the Superhighway schemes. So, far from being ‘scathing’, London’s emergency services actually support the Superhighways – but a listener to LBC would have gained precisely the opposite impression. Of course, this kind of response – however misleading and incoherent it might be – is actually a sign that Transport for London is building cycling infrastructure that is effective, and that matters. It is making a statement that highway space shouldn’t just be solely for the flow of motor traffic; that cycling can and should be accommodated, for sound strategic reasons, set out by the Mayor himself. With London’s population growing by 10,000 a month, there are only two ways to keep traffic moving – build more roads, which is for the most part physically impossible, or encourage the use of vehicles, such as bikes, which better use the space on the roads we’ve already got. London – and other British cities – are starting to build something that people feel the need to oppose. That means something. Bring on the backlash. Excellent article, bang on the point. Re the point about people choosing not to use the infrastructure, there are two similar examples from CS2. Both relate to the existence (or otherwise) of a network of segregated routes. By network here I mean local network rather than a city wide one. Example 1. It is my observation (and only that), that historically before the CS2 upgrade, a significantly higher number of people on bikes would cycle over the Bow flyover (rather than the roundabout underneath) westbound rather than eastbound. I include myself in those statistics. In the mornings, I would almost always go under the roundabout, and in the evenings, cycling home, I would go over the flyover. This is because, going west into central London, to use the flyover – the “road” – means taking an active decision to leave the segregated track, whereas going eastbound, because you were already in the carriageway it is an easier choice to continue on the road over the flyover rather than go underneath it. I notice some people use the flyover in both directions (presumably because it is quicker), but my point is that the proportion doing so are much higher in one direction. Once the segregated tracks are open going eastbound, my prediction is that most will stick on them rather than choosing to leave them to use the flyover. Example 2. A similar point. The recent, highly publicised, hold the left turn lights opened at a few junctions. One current issue with these is that the bike lane ‘green light cycle’ is shorter than the straight ahead general traffic one. If you arrive at the lights as they are already green, many on bikes will prefer to stick to the general traffic lane rather than veering into the cycle lane as chances are you will get through the lights if you do the former, and not if you choose the latter. I have heard a few “get in the cycle lane” comments from drivers directed at those on bikes who choose the general traffic lane. However, the key point is that the segregated tracks either side of the lights are not yet open, so cyclists are in the general traffic lanes already and in a position to make that choice. Once the route is open fully, assuming bikes are in the segregated lane on the approach to a junction, I predict that there will be far fewer who choose to leave the lane, and cross a lane of left turning motor traffic in order to the get in the straight ahead traffic lane. I guess my point is the same as yours: once you have a decent level of cycle lane coverage, built to a decent quality, there become less of a temptation to not use it. Some will, but this is there choice, and any suggestion that they be fined for making that choice is a sideshow. However, most will use the facilities provided. CS2. Hopelessly narrow, full of chicanes and puddles. Totally useless for the experienced commuting cyclist, in a way that the previous road layout never was. If it would encourage kids to cycle to school I and other people to cycle to the shops etc., I would put up with it. But how are we ever going to get these people on a bike when the elephant in the room – really s&*t Wild West drivers – isn’t being tackled? Most of the people I see cycling in both directions tend to use the Bow flyover – especially at the moment, given the fantastic pavement option we have been bestowed, westbound at Sugar Mill Lane. But the flyover is strictly off limits, according to the CS2 designers. Every day I am forced to use the CS2, I hate it even more. 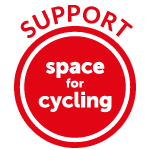 After 30 years of cycling the same route, since they installed CS2 they have ruined my commute. Aren’t longer journey times possibly *better* for taxi drivers, in that they get paid more for the same journey? Bold. In NL, Bold, may not be best, but outside of DK or NL, BOLD has my support. Then again, you brits and yanks have that saying mind what you wish for. Happy sailings. Across the channel I’m cheering for cycling in UK. Lovely article – straight to the point and encapsulating all the things I was struggling to articulate. I used to do Mass years ago and stopped when I felt the congestion charge and hire bikes had made a difference. The need to push hard had left me. After reading this, and attending the last Die In at Bank, it’s back. See you all on Friday outside TFL. Cheers. We live in a society where motorist entitlement rules. Anything which actually challenges the supposed “right” to drive where, how, when and why you want is going to be opposed. In fact, anything which merely questions that “right” will lead some motorists to apoplectic meltdown. The one thing I would argue with is that useless cycle lanes did not attract a backlash – in fact very often they have: I remember responding to irate objections to advisory cycle lanes and advanced stop lines years ago. All of which shows that anything which actually challenges car supremacism – re-allocating road space/highway capacity from motors, enforcing road traffic law, reducing subsidy to drivers etc. – will indeed suffer a backlash. We should be well prepared for it. Here in Bristol the city council built a “proper” segregated cycle path alongside a major city centre street – Baldwin Street. OK, it only runs for a couple of hundred metres, but they really did put thought into it: narrowing the road, narrowing the pavement, and removing some parking spaces so as to build it out. It’s not perfect, but it’s pretty good. After it was completed, the main complaints about it were from pedestrians complaining about cyclists travelling too fast on it and buzzing them (except it is not a shared space: it’s marked up to look like a road, with a kerb, centre-line, and different surface, and pedestrians shouldn’t have been walking on it anyway). However, and this fits in slightly more with the article and (IMO) also echoes with the current Mini Holland controversies, the local paper made great capital out of how the loss of parking spaces to build the cycle path was going to drive local restaurants to ruin. You know how many parking spaces lost it apparently takes to drive local restaurants to the wall? Three. Three parking spaces were removed, but the local businesses were up in arms about how it was absolutely disgusting that the council would do this to hard working businesses ‘just to help those cyclists’. I am really curious if this backlash occurred in the Netherlands 40 odd years ago. Not rhetorically, either; I really don’t know. Does “backlash” include the way that if cycling infrastructure is built – no matter it’s quality or convenience – then motorists start getting even angrier (and feeling justified about it) if cyclists don’t use it? I ask, after last night having a passenger in a white van shout at me for not being on the f-ing cycle path (as the van overtook me, then slammed its brakes on to avoid running into the back of the traffic ahead). I use the cycle path in question going to work (it gets me off the main road when – rather slowly – going uphill), but choose not to use it when coming home (as I can get up a pretty good speed and being on the main road gives me priority over the side roads). The way it’s laid out means I’d get up a good speed only to have to stop and then wait five minutes to actually cross the road (using the new pedestrian/cyclist refuge/island) through rush hour traffic in the evenings. I grumbled about it to my wife afterwards. She said that all that money has been spent to put the new cycle path there and then people get angry when they don’t see cyclists using it. I said I do use it when it is convenient for me to use it, but don’t when it isn’t. I also suggested that there is no obligation on cyclists to use it, and that having a simple refuge rather than an actual crossing (which would have held up traffic on the main road, according to the consultation report) was rather a ‘fail’. (For anyone who knows it, I’m talking about the new section of the cycle path alongside the A369 between Abbots Leigh and Pill, outside Bristol).